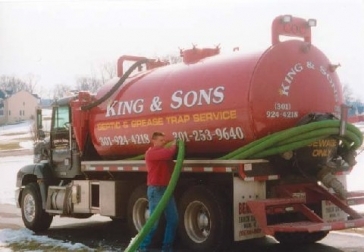 A septic system has two major components: a septic tank and a drain field. Wastewater sewage flows from the house to the septic tank. The tank retains the solids while the excess water flows off into the drain field. 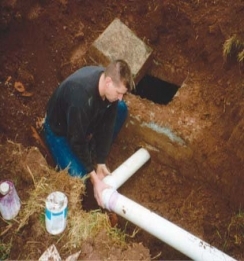 You may have a traditional drain field also known as a trench (this is the most common type of drain field), a seepage pit (dry well), a sand mound system or a drip system. ​Limit garbage disposal use (do not put vegetable peelings, eggshells and coffee grounds in disposal). ​Do not pour oils and fats down the drain. ​Do not overload system...early morning & bedtime are peak bathroom use times, try to run dishwasher and washing machine at other times of the day. Do not put paper towels, cigarette butts, disposable diapers, sanitary napkins, tampons, and other materials in the toilet, put them in the trash. Do not add yeast or "starter enzymes" to your system. There is plenty of natural bacteria available to do the job. Additives do not improve the performance of your system. Do not drive or park over the area of your septic. ​Do not plant trees near a drain field because large roots can clog or break a pipe. Toilets run slowly or back up. In worst cases, the basement could flood with sewage.